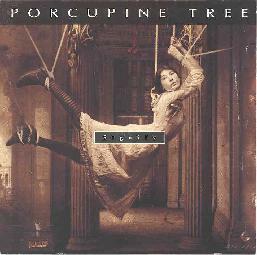 From one release to the next, Porcupine Tree never fails to offer something new. Though primarily a vehicle for musician/producer Steven Wilson, the core band lineup is the same as on 1995's Sky Moves Sideways: Wilson on guitars, keyboards, and effects, Richard Barbieri on various keyboards and synths, Colin Edwin on bass, and Chris Maitland on drums. Each release seems to be a progression for the band (I'm familiar with the last three). Up The Downstair was the most overtly psychedelic. The Sky Moves Sideways was heavily Pink Floyd influenced with mostly instrumental space adventures in the 15-20 minute range. And now we have Signify, the most accessibly song-oriented release yet. Despite this accessibility, Wilson excels at backing songs with great music. The disc opens with "Bornlivedie", a short segment of voices, turning radio dials, and various other sounds that serves as a lead in to the title track. "Signify" takes a basic hard driving rock beat made interesting by the accompaniment of flowing synths. Among the vocal numbers on the disc is "Sleep Of No Dreaming", which features dreamy verses that blast into a heavy space chorus. "Sever" layers superb guitar, synth, and vocals over a basic beat. "Every Home Is Wired" seems to be an indictment against the internet with the lyrics, "Modem load and failsafe; Electric teenage dust; Hit the solvent keypad; Start the neural rust". "Pagan" is a short soundscape that again serves as an intro, this time to "Waiting Phase I" and "Waiting Phase Two". Phase One is the song portion and features vocals harmonizing with some incredibly tasteful guitar playing. Phase Two is the instrumental part. Subtle guitar and synth passages play over an ethnic percussion beat which slowly builds in intensity. The band seems to like this beat as "Idiot Prayer" opens with dreamy atmospherics, but then launches into a tribal rock beat with cosmic voices and effects. "Intermediate Jesus" is one of the more psychedelic tracks with its acidic guitars, piano, and effects. The song is neither fast paced nor hard driving, but nevertheless manages to be intense. "Light Mass Prayer" is a simple Tangerine Dream sounding piece that would serve well as an intro, but at over four minutes is way too long. Coincidentally, this is the only song Wilson had no hand in writing. But the band finishes with grace on "Dark Matter". The disc's longest trace, the song grandly alternates between hard driving space jams with subtle atmospherics carrying the listener along on a smooth easy going rock beat. Signify was a welcome new release proving Porcupine Tree to be a band who always finds new ways to express themselves. There are many great Porcupine Tree web sites out there, but the best one to start with is the Linton Samuel Dawson site. You can also visit the Delerium site for info on this and the many other great releases on that label.